A few weeks ago my pal Brandie from The Country Cook asked if I’d like to participate in a little contest sponsored by Kraft and Philadelphia Cooking Creme. 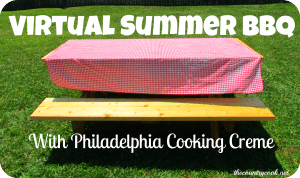 They asked that I, along with a few other bloggers, create a cold summer BBQ side dish using their Cooking Creme product. Well, I don’t know about you, but the first thing I think about when I think of BBQ sides is potato salad. But, I’ll have to admit that my family and I are pretty traditional when it comes to this dish. Nonetheless, armed with 8 tubs of Cooking Creme, I set out to create a delicious side dish for them. Boy was I surprised at how easy and delicious this dish turned out. Even my reluctant family showed their approval by practically licking the bowl clean. You all know I strive to provide y’all with easy recipes that use everyday ingredients and this one is no exception. But don’t let the simplicity fool you, this dish is packed with flavor! Now onto the contest part: Below is the list of all the bloggers participating in the contest. Each of us has prepared an original dish to bring to the potluck. This is the part where you come in… Simply leave a comment below to vote for my Southwest Potato Salad. The recipe with the most comments at the end of the 24 hour voting period will win $500 and a year supply of Philadelphia Cooking Creme! Won’t you comment below and help me win!?!?! You can only vote once, but you’re welcome to invite your friends to vote as well! I’ve got the best readers ever and I GREATLY appreciate your support!!! UPDATE: WE WON!!!!! Thanks so much for all your encouragement and support! 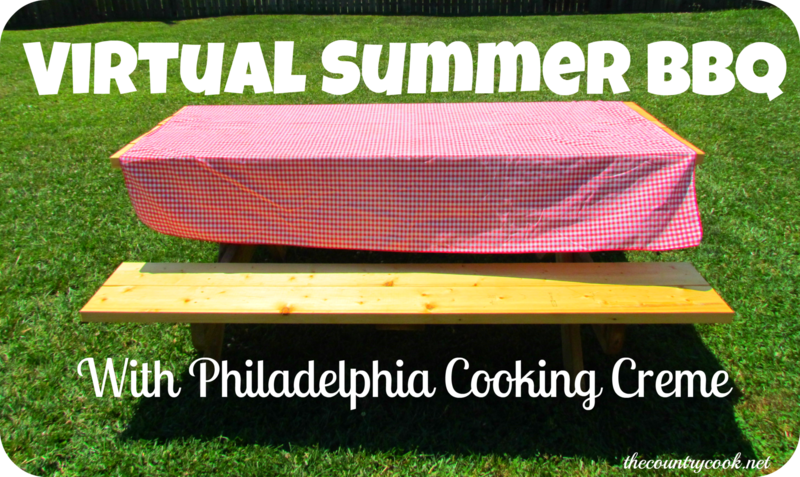 As a result, my Southwest Potato Salad was named the winner of the Summer Virtual Barbecue with Kraft, Philadelphia Cream Cheese, and Philadelphia Cooking Creme! Wash potatoes thoroughly and place in a large pot. Cover with water and add 2 tablespoons of salt. Cook until potatoes are tender but not mushy. Combine mayo, Santa Fe Blend Philadelphia Cooking Creme, and red wine vinegar in a small bowl. Peel and thinly slice red onion. In a large bowl lightly toss potatoes and onions with dressing. Absolutely one of the best I have ever tried! 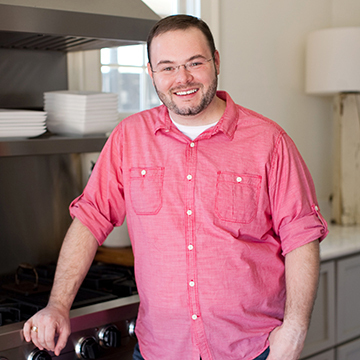 Great blogger and always has awesome recipes for us! Haven’t tried this yet, but it looks and sounds delicious! This sounds divine!!! Can’t wait to try this one!! Looks delish! We’ll definitely be trying this one! Just in time for “end of summer” menu re-runs. I can’t wait to try it! Sounds great. I love Philly Cooking Cream. I be this would be good too with the Italian blend. If this recipe is like many of the others this blogger has shared, it will be a hands down winner! Wow looks amazingly delicious and easy. Will def try. Going to make this…sounds wonderful. Never been a fan of potato salad (just can’t get past the cold part) but this looks really yummy!! And good luck!! Great. Love your site. I keep up with all the post. Good luck. This looks awesome!!! All of your recipes that I have tried, have been amazing!! I’m sure this one will be just as well !! One of my favorite foods of all time! I am so fortunate to have a family who lets me eat the whole thing. This looks wonderful…thanks for sharing with us! Mmmmm- cant wait to try it! Looks DE-LISH! Will have to do it with burgers and dogs we are grilling this weekend. Thanks for all your great recipes Stacy! Can’t wait to try this recipe. Every recipe I’ve tried from Southern Bite has been fabulous! Great dish Staci! Another wonderful southern masterpiece! Ummmm. Sounds yummy! Will make this for our Sunday dinner with the kids. This sounds delicious. Thanks for sharing another great recipe. sounds heaveanly, can’t wait to try it! Easy enough that even I could make it and Southern Bites’ recipes are always outstanding! This sounds so good and can not wait to try it. I am thinking of it warm also would be great. Good stuff!!!! I like it!!!!! WooHoo!!!!! Will have to try this out….looks very yummy! Yummy…Love new potato salad recipes. The best recipe and easy! This looks yummy. Thanks for posting. I like their cooking cremes. Have tried them in some chicken/veggie dishes. Yummy! That new cooking cream is awesome too. Used it with a veggie sandwich and love it. I have used the Cooking Cremes numerous times, but this is the most creative recipe that I have seen. I plan to serve it soon! Yummy! Sounds easy enough and looks yummy enough:) I can’t wait to try this! Look forward to trying this recipe. Sounds great. Looks good…….just like all of your great recipes 🙂 Can’t wait to try it, Stacey !!!! Can;t wait to try this …. Sounds good, gonna try real soon!!!! Sounds devine, would go well with many summer dinners! love the tater salad recipe! tried it, and it was a BIG hit @ the cookout – even my in-laws liked it! This sounds tasty indeed! I think the kick from the Santa Fe blend would be a perfect go to with any kind of summer barbecue item! Great recipe ! The best tasting & very easy directions ! You have a winner here ! Recipe sounds interesting but I’m too southern to mess with my “Tater Salad Recipe”. This looks great – I will definitely try it! Will be trying this recipe this weekend!!! Yum!!!!! Can’t wait to try it. Yum! Potato Salad .. it just wouldn’t be summer in the South without it! Looks delicious! Looks so good, can’t wait to try it!! Such a good BBQ side!! This really sounds great.Will be trying this over the weekend. ooo!! this sounds good!! I haven’t tried the creme yet, i’m gonna have to pick up a package this weekend to try! Southwest Potato Salad!!! Haven’t tried it, yet, but definitely will. Hope you win!!! Potato salad recipe sound delightful. Can’t wait to try it. this looks great…. plan on making it sat for a birthday party! Sounds so good on these hot summer days, can’t wait to try it. No more callers, we have a winner. Excellent use of ingredients. This sounds and looks so good…just like everything you post. Can’t wait to try it. Good luck in the contest. I’m looking forward to trying this recipe. Looks delicious. LOOKS AND SOUNDS DELISH! JUST ANOTHER GREAT RECIPE FROM SOUTHERN BITE. WILL DEFINITELY MAKE THIS OVER THE WEEKEND AS WE ARE PLANNING A COOK-OUT. 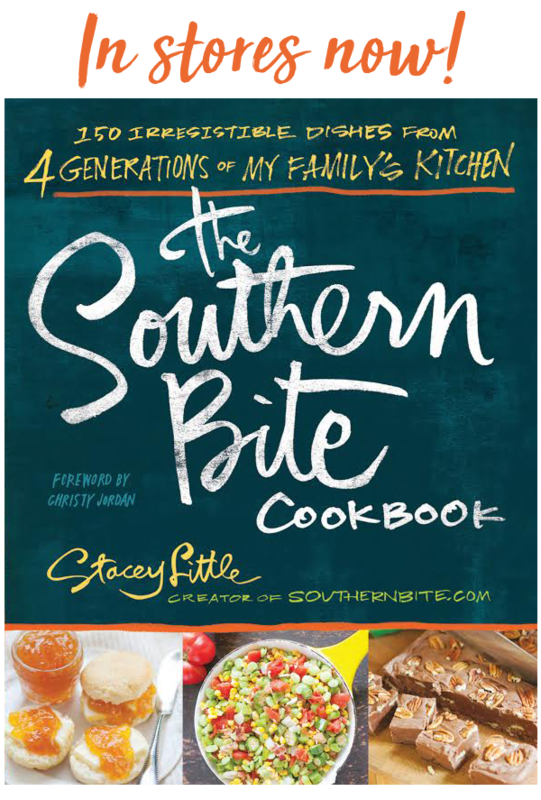 tHANKS AGAIN SOUTHERN BITE FOR ANOTHER GREAT RECIPE TO ADD TO MY COLLECTION…. Love tater salad…looking forward to trying this version. Thanks for sharing. Looks good. Will try it soon. Thanks for sharing. Wonderful take on tater salad. I will be trying this recipe this weekend. Love the looks of this. Definitely will give it a try. Looks yummy and very simple. Sounds incredible! Can’t wait to try it!! We love potato salad. Can’t wait to try this recipe. Sounds and looks good! Hope to try it soon! I know the Southwest Potato Salad will be delish. Can’t wait to try Southern Bite’s Southwest Potato Salad! This looks sooooo yummy. Now if they could only invent Cyber-Tasting! YUMMY! Sounds delicioso! Can’t wait to try it!! Potato salad is one of my favorites and I cannot wait to make this for my family for us to try it out! I’ve been looking for something to try with the new Kraft cooking creams and this looks like a great recipe I want to try. Very creative. Thanks for sharing this! I have seen this product in my grocery and have been wanting to try it – this sound perfect! Oh, I am going to make this for a family reunion this Saturday in Opelika! What a wonderful potatoe salad!! yummy!!! love it!! That potato salad looks so good. I will try it soon. It will give me a chance to try the cooking creme, which I have never tried. Thanks for all the good recipes. Stacey – the potato salad looks delicious!!! Sounds yummy!!! Simplest is often the best. Potato salad recipe looks just like one I will try. 4-sure! Good Luck! Sounds delicious! I will try it this weekend. Great a new idea for that awesome sauce. Thanks! This sounds wonderful, different from the same old same old! Hey, good luck with the contest. What’s a barbecue without the potato salad! Southern Bite’s Southwest Potato Salad recipe using the Philadelphia cooking creme looks divine. I used one of the Philadelphia cooking cremes earlier this week to flavor pan-fried chicken breasts that I was serving with fresh broccolli, squash & onions. The dish turned out great, & I’m eager to try the cooking cremes for recommended pasta dishes now. You have my vote…this looks DELICIOUS!!! Potato Salad looks great – think a weekend bbq is in our future! Was looking for a new potato salad recipe – Southern Bite certainly gets my vote! We are having friends over to grill out this weekend… I think I just found what I was looking for to serve as a side!! Anything with potatoes and Philly creme cheese or cooking creme has got to be the best. The Southern bite gets my vote…gonna try this tonight with meatloaf and fried green tomatoes. Wow – Awesome Potato salad. It sure made our family get together picnic delicious!! Thanks soooo much, I’ve already been asked to make this again for mom’s birthday party. This potato salad is making my mouth water. It absolutely looks delicious and I can’t wait to try the recipe! This looks like a winner!!! Can’t wait to make it for the family!! Thanks for sharing. Good Luck! This looks so good and easy! I look forward to fixing this in a couple weeks for the Topeka Garden Club meeting/pot luck! Looks wonderful! I’m going to try it this weekend. Looks and sounds great…pleasant change from the usual. I love the cooking cremes so I will be sure to try this! Love your website – can’t wait to try this new recipe! very creative recipe by you. Look forward to trying it. I love the recipes from Southern Bite! I have this cooking creme in my frig. Looking forward to trying the recipe! Love your blog Stacey, keep the great recipes coming! Cant wait to try this yummy sounding dish…. Anything with philly cream in it is delish!! Wow, this sounds great! Can’t wait to try it. Love the simplicity, I will make it this weekend. love cream cheese – can’t wait to try this! Great recipe to add to summer recipes! Thanks. that picture looks so good! can’t wait to try it! Love a new twist on a classic, this sounds delicious and I’ve been wanting potato salad, have these ingredients on hand will try this weekend. Thanks for posting it. Wow Stacey! This looks amazing I will be trying this soon! Found your site from a Philadelphia FB post. Of all the recipes this is the one I’d most like to try. I need a potato salad recipe that’s not my grandmas and this looks both easy and flavorful. This sounds wonderful! You have my vote! It’s so yummy… You have my vote! With those ingredients, it has to be scrumptious! Good luck. You get my vote! Just put a Flank Steak in to marinade for grilling tonight. We’re going to have your tater salad on the side… looks delish. Red potatoes + Philadelphia Cooking Cream? How could you go wrong with making this dish? Looks delicious!!! Another delicious recipe. You certainly have my vote. I haven’t tried the Philly cooking creme yet. Now I have a great excuse! This looks delicious! This recipe is delicious! Thank you Southern Bite for the idea and for turning me on to Philadelphis Cooking Creme. Man oh man, this is going to be on my table as soon as I can get it made!! What a wonderful recipe, thanks so much for sharing! Love the site! Greetings from Gurley! My third try at posting a comment – this looks good, and i sure hope you WIN ! Wow…this recipe sounds delicious! Looking forward to making it! Thanks for another wonderful recipe! This looks delish, but then almost all your recipes look good and the ones I have tried are very good. Will Like you my potato salad is tradishional, potaotes, onions, bolied eggs, pickles, mayo, mustard and salt & pepper. But every once and awhile you want something a little different. Good luck in contest. perfect side for a bbq on a hot summer day, great idea using the Philly cream cheese sauce which i’ve seen at the store and have not bought, but now i will. This looks yummy and easy to make. Thanks. Great summer recipe!!! Go Southern Bite!!! Looks good! Love potato salad, can’t wait to try this one. Best of Luck!! Looks great! Wish I had some now. Looks like a cool salad for a hot day. omnomnomnom! Need to cook this, you are making me hungry! Thanks for the great recipe, Southern Bite. Looks delicious – great new twist on potato salad! I am so happy to have the opportunity to vote for Southern Bite’s Southwest Potato Salad Recipe. When the recipe first appeared in my Email yesterday, I knew it would be delicious, so I immediately shared it with my friends on my Facebook Page. The next thing I did was go to the grocery store and purchase some “Santa Fe Blend Philadelphia Cooking Creme” so I could make it for a patio party this weekend. I’ll be serving it with BBQ chicken, BBQ Baked Beans, and Sliced Tomatoes. If ya’ll can smell the BBQ wafting through the air, you’re invited. If you can’t, please vote for Southern Bite’s Southwest Potato Salad entry anyway. It’s a winner!! Every recipe I’ve tried of yours has been great. I have no doubt this one will be too. I can’t wait to try it! You can never go wrong with cream cheese! Going to give this a try this weekend! Stacey ~ You’ve certainly got a winner here!!! Good Luck. Another awesome recipe! Thanks, Stacey!!! I can’t wait to try this, all my favorites! Love the combination of creamy potato salad and a little spicy kick — what a great idea! Perfect for grilling out. And I love the Philly cooking cremes. Can’t wait to try it. Just bought ribs and shoulder for smoked bbq (if it ain’t pork, it ain’t bbq). Will make another trip to store for Philadelphia Cooking Creme to make your Southwestern Potato Salad. Thanks for the recipe and all the others I have enjoyed. You get my vote. Looks great! Anything made with cream cheese has to be good. Will look forward to making this. Thanks Stacey for all the recipe’s. Love potato salad. I’m sure it will be great with this new twist! This recipe seems so easy to make! Sounds great (except maybe for the Philly cooking creme). This really looks good. I will certainly try it sometime. Thank Kristian K for my vote. I’m going to try this, sounds yummy! This sounds simple and delicious and perfect for my CSA potatoes i have waiting for me in my kitchen. Good luck! Sounds great…I will be trying this potato salad with Philadelphia Cooking Creme! This looks great! I love potato salad and I want to try this soon. This is definitely a recipe for a picnic or BBQ.. Simple and easy plus tasty! Looks delish. Trying it this weekend. Looks good and easy, going to try this soon. I’m pretty much a “traditional” potato salad person, but this sounds interesting enough to give it a try! Good luck…. I am voting this Southwest Potato Salad by Southern Bite as my favorite. Made this for supper and it is really tasty. That sounds absolutely YUMMY! Gonna try this this weekend. So glad to find a recipe for potato salad that the dressing is not all mayo. Must try it soon. Have enjoyed all of the recipes from Southern Bite that I’ve made. Thanks for the recipes using things you keep on hand. Now I’ll keep the Cooking Creme on hand too. I can always count on you to find the best recipes! This one looks great as well. Yum! I can’t wait to try this!! This looks sooo good…Can’t wait to try it..
Love potato salad and trying new potato salad recipes. This one sounds great! Nothing like potato salad for any summer occasion and this one looks like a winner. plain and simple…just my style!!! This really looks like a good recipe. I am always looking for new ways for old recipes. Looks so delicious, will definately be trying this! Thankyou for posting!! This looks so good! Definitely has my vote! Yum!Yum! Yummy! Can’t wait to try!!! sounds delish!!! need to try this! Like most country cooks I have my own potato salad method, can’t quite call it a recipe because I make it for two or for 150 (church funerals) but this is worth a try — hope you win the contest, too. This dish makes summer BBQ go from boring to WOW. Sounds yummy… just like all your other recipes! Good luck!! Can’t wait to try this! My mouth is watering already! Yummy!! Going to try it this weekend! Southwest Potato Salad and Southern Bite get my vote! As soon as our neighborhood grocer gets this product in their store, I am purchasing this creme and can’t wait to try this. I love potato salad and cream cheese so this recipe should taste like heaven sent! This sounds so good. Can’t wait to try it. Your recipes are always tops with me. Delicious!! Combines some of my favorite ingredients in such an easy recipe! OMG, this sounds sooo great… am gonna have to try it out for myself!!! Potato salad was always a staple for weekends when we cooked out as a family. Nowadays, the family doesn’t get together that often, but I know this would be a huge hit. Thanks for sharing. It looks awesome!!! This looks amazing,really simple too. I’m going to try it this weekend. Great site and great food. This looks cool and creamy and yummy for summer! this is wonderful! I agree Southern style potato salad is the best. You may have changed the way I think. Will definitely try this recipe, added the Cooking creme to my grocery list this weekend. Always have been a faithful reader of your site and have tried many of your recipes. I especially enjoy your style and varities of foods. Good luck with the contest! Thanks for this recipe! Saw the Phildelphia Cooking Cremes but wasn’t sure how to use them. This is a great way to start! Cooking Creme…interesting..going to try it. My oh my does that recipe look scrumptious! 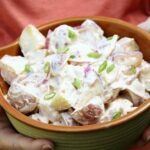 Potato salad is one of our all time favorite summer side dishes and I can’t wait to try this recipe. (Hope you win). Quick, easy, and Delicious! Stacy, you’re the best! Thanks for your website and recipes. I love it, and use your ideas all the time!! I am going to try it this weekend! Sounds great and so simple. 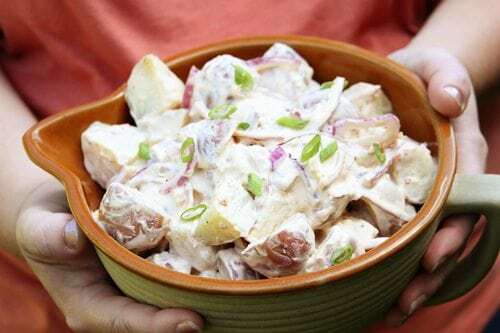 Thanks for posting the recipe for this yummy looking potato salad using the cooking creme. This potato salad sounds delicious. I have been wanting to try the Philadelphia Cooking Creams, and this sounds like just the recipe I’ve been looking for! Thanks! Mmmm! Sounds yummy! Can’t wait to try this. Sounds great, looks yummy, can’t wait to try it! I have to say I think you got it in the bag. I will be making this. Have tried SEVERAL of your recipes and found them to be quite tasty. Can’t wait to see if I can find this Southwestern Creme in my neck of the woods. Potato Salad is a favorite! I will be trying this one! very good..I votged this AM however I do not see my coment? This recipe sounds great. I like the “southwest” taste in different food and a change of pace. This recipe has both for me. Hope it wins. Your potato salad recipes sounds yummy! Can’t wait to make it for myself. Thanks for the recipe. Sounds yummy! I’ve seen the cooking cremes, but didn’t know how to use them. I’ll definitely try this recipe this weekend. This is very tasty and delicious. You really have a winning recipe. I’d like to try the cooking crime. Where do you find it? Congratulations! Just read on another site that this won the competition. I’m going to try this; my regular store does not stock the cooking creme yet. I’ll try Publix. sounds so good, can’t wait to try it!!!!! This looks delicious! I always enjoy your recipes! Sounds delicious. Never thought of using the cooking creme for potato salad. Great idea. Sounds delicious and easy to do! This looks like it will quickly become a family favorite!